i have tried the newest reshade versions, then some 3.30, 3.08 and so on like 10 different builds but no matter which version i use there is no sharpness strenght slider anymore. but nothing about sharpen strenght. There never has been a strength slider in AdaptiveSharpen. That did not come from the official source then. Last Edit: 5 months 17 hours ago by klotim. 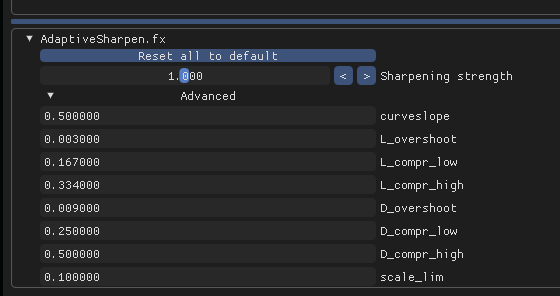 It's also in the preset you posted (the "curve_height" value). Last Edit: 5 months 16 hours ago by crosire.